My latest visit to Las Vegas was an eye opener to the ongoing evolution of Sin City. Harrah’s Hotel & Casino, located at the center of the world famous Strip, recently spent over $30 million renovating their Valley Tower rooms and suites. Harrah’s Casino has it all: 80+ tables including craps, blackjack, roulette, and baccarat. There’s a keno lounge and a new state-of-the-art race and sports book, plus over 1,200 slots and video poker machines. There are five daily, low buy-in tournaments in the Poker Room. There is also a nice mix of cash games. Locals make up about 50% of the players; always the sign of a well-run poker room. Entertainment choices abound at Harrah’s: bars, musical venues, and stage shows. There is a small spa with a salon and fitness center. A workout followed by a whirlpool and spa treatment is a perfect way to unwind. 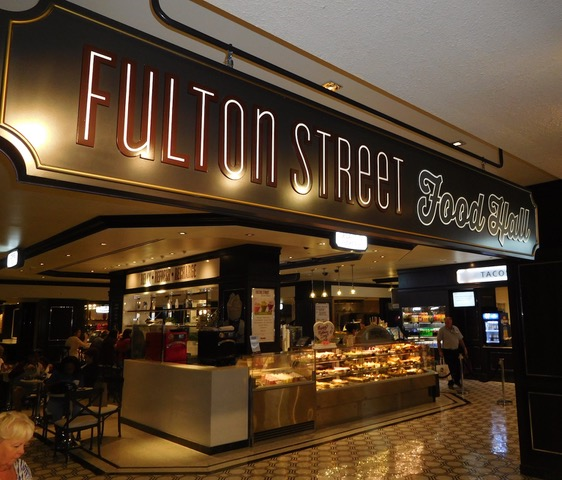 I frequented the Zagat-rated Fulton Street Food Hall every morning for a breakfast that included freshly baked pastries. There are interesting food stations serving lunch and dinner. Toby Keith’s, I Love This Bar & Grill, is a must for fans of country music and down-home food lovers. Live music begins at 9 PM with no cover charge. 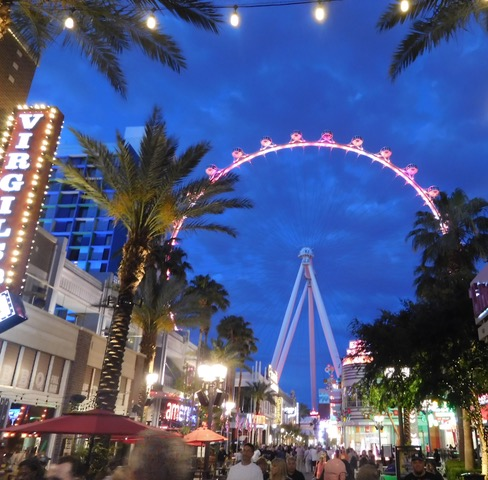 Right outside Harrah’s door is the #1 attraction in Las Vegas, the LINQ Promenade. It was also voted the best family destination in town. It’s as if a stage set were ripped from Disneyland and plopped in the middle of The Strip. Restaurants, bars, and specialty shops line the street of this entertainment district. The centerpiece is the High Roller, the world’s largest observation wheel at 550 feet tall. Ride it at sunset for spectacular views of the Strip, all of Las Vegas, the Spring Mountains in the distance, and to experience the 2,000+ flashing, colored LED light show. The project cost $550 million to build. (www.TheLinq.com). Plan a couple of meals at the LINQ Promenade. Stop by Gordon Ramsay’s version of take-out fish and chips. I tried the shrimp…they were plump and perfectly fried, enhanced by a choice of dipping sauces, (www.GordonRamsayRestaurants.com). 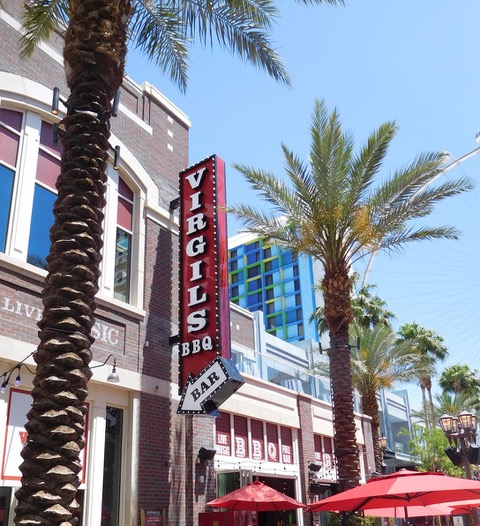 Virgil’s BBQ serves up first-rate sandwiches, plates, and burgers influenced by the regional flavors of Carolina, Texas, and Memphis. There are 14 beers on draft to go with starters like homemade potato chips and fried pickles. (www.VirgilsBBQ.com). Harrah’s is part of Caesar’s Entertainment’s casino brands. Go to the benefits program and sign up for discounts, specials, and upgrades (www.TotalRewards.com). You earn credits whenever you play, eat, or shop at any of their properties worldwide. Harrah’s Las Vegas’ resort fee includes: premium Wi-Fi access for, local calls, and daily fitness center access. Logon to http://www.Harrahs.com for reservations and information.